Join Café Ventoux & Rutland House Community Trust for the First ever Tugby Trail off road running event. 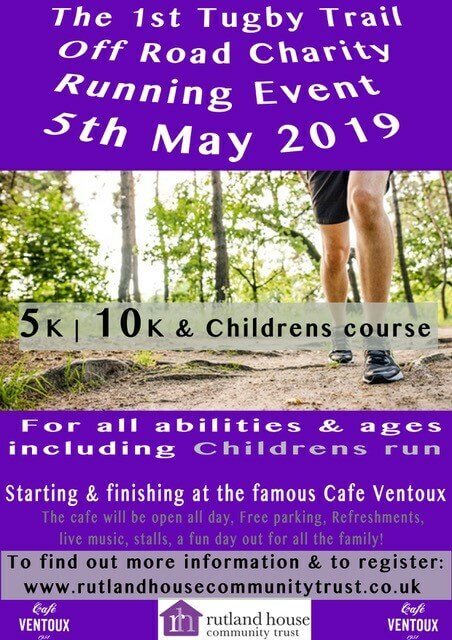 The Childrens run will take place within the 20 acre grounds of Cafe Ventoux and the Cafe Ventoux owners will cut a grass course which will be suitable for Wheels chairs also. – Fun for all the family! Rutland House Community Trust was founded in 1989 when two local people, Hazel and Terry Jeffery, identified that there were no services locally for people with learning disabilities. Their vision was to build a residential home in Oakham for local people, and after some years of fundraising, Willowbrook opened its doors in May 1995. This was officially opened by H.R.H The Duchess of Gloucester. Since then it has expanded it’s service to include 2 supported living homes, also based in Oakham. The residential home is now 23 years old and in desperate need of a full refurbishment. Moving with the times the building needs updating so that the service users have their own bathrooms, more space and more communal areas. This would vastly enhance their quality of life. The Trust has also identified that there is a high need in Rutland for additional supported living, as well as respite care, and safe places for people in transition or crisis. This is something the Trust know they can provide. The plans have been drawn up to refurbish Willowbrook, and to build 8 new units, in which they will offer the above support for long- and short-term residents. Planning permission for this has been granted. The total cost for this is £1,804,198 (estimated by a quantative surveyor), and because they are a non-profit charitable organisation, they are relying solely on grants and fundraising to achieve this goal. The RAF Association is recruiting cyclists for a fundraising challenge across Rutland to help support RAF veterans and serving personnel. 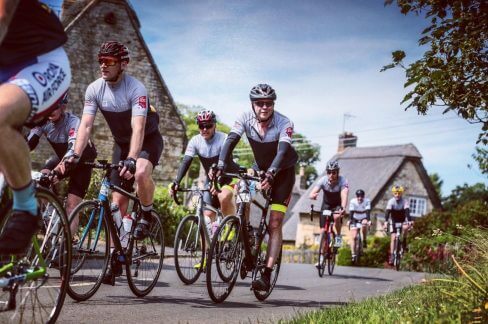 We will be staging RAFA Rides: Rutland on Saturday 15 June, and are looking for members of the public to sign up to either the 33 mile, 70 mile or 100 mileroute, with a view to raising more than £20,000. Air Vice-Marshal Gary Waterfall, RAF Association ambassador and supporter of the event, said: “We’d love to get as many keen cyclists as we can to take part in this fun challenge through the rolling hills of Rutland and its surrounding counties. The longer routes, which includes picturesque views of Rutland Water and the Vale of Belvoir, are aimed at experienced cyclists, while the shorter 33 mile route is ideal for those new to cycling challenges. All cyclists will receive a medal, as well as a beer or soft drink and a pulled pork roll (veggie option available) also at the finish line. A live band and other entertainment will also be provided at Café Ventoux, and food stations along the route will offer delicious refreshment to the riders throughout all routes. The registration fee goes towards the cost of running our cycling sportive, so every penny you raise in sponsorship will go the RAF Association, which is committed to members of the RAF family and delivering help and support where it is needed. For those of you with busy schedules, online fundraising is one of the quickest and easiest ways to raise money. By setting up a JustGiving page for example, you can let your friends and family know you are taking part in this cycling challenge, and ask them for their support. Perhaps you could ask them to donate a pound for every mile you cycle, raising £100 if you complete the longest route? To register your places for the RAFA Rides Rutland, please click on the button below. 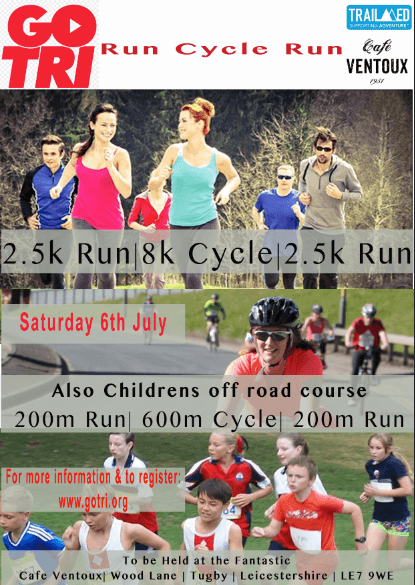 The Children’s off road Tri Course will take place within the 20 acre grounds of Cafe Ventoux – Fun for all the family!